We frequently utilize the USDA’s farm income data to monitor and report about farm economy, especially given the large, rapid decline in farm incomes since 2013 (you can read our latest post on net farm income here). For this week’s post, we decided to consider off-farm income and what impact it has on farm households. In figure 1, the USDA’s estimated total annual farm household income from 2012 to 2017 (forecasted) is shown. Total farm household income has two components, on-farm income (shown in blue) and off-farm income (in red). On average, off-farm income is an important component of total household income as it’s accounted for around 70% of total farm household income since 2012. Across all farms, on-farm income over the last six years has ranged from a high of $31,000 (2014) to a forecasted low of nearly $23,500 in 2016. For 2017, for on-farm income is expected to slightly increase. Off-farm income also peaked in 2014, at more than $103,000. As the farm economy contracted, off-farm income also shrank for farm household as it fell by 7% by 2015. Since 2015, the USDA has forecasted off-farm income higher, but below 2014 highs. In recent years, the drop in on-farm incomes correlated with a drop in off-farm income. While the data in this post focuses on average farm income, the USDA also provide another measure – the median. Median on-farm income over this time-frame was always negative, ranging from -$118 to -$2,250. This tells us that on any given year more than half of all farms had negative on-farm income. We will explore that a bit more below. Figure 1. 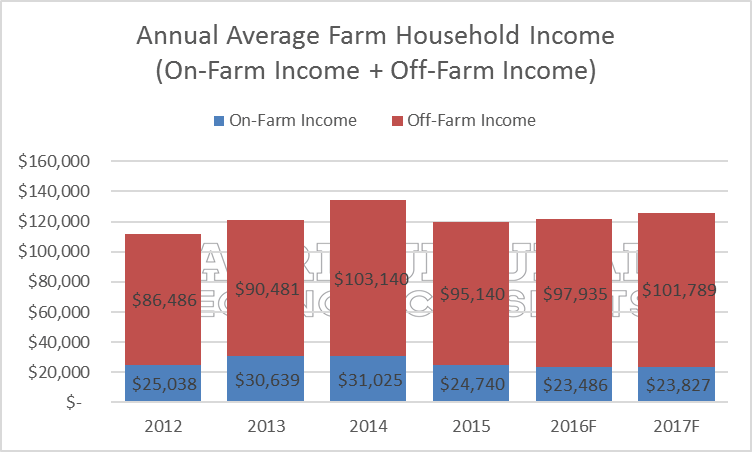 Annual Average Farm Household Income; On-Farm (blue) Plus Off-Farm (red), 2012-2017F. Data Source: USDA ERS. To understand the on-farm and off-farm income story in more detail, figure 2 shows average farm household income in 2015 by farm type category. As in figure 1, total household income is the sum of on-farm (in blue) and off-farm (in red) income. For these data, the USDA provide three categories of farms. Residence farms, which account for 60% of all farms, have less than $350,000 in gross farm income and the operator is retired or has primary occupation other than farming. Intermediate farms are primarily engaged in farming and have less than $350,000 in gross farm income; they account for 31% of all farms. While these farms account for the majority of operations, 90% or so, the USDA also reported that in 2015 that these farms accounted for less than 25% of the total value of agricultural production. The third category – commercial farms accounting for 9% of farms – are those with more than $350,000 in gross farm income. This group accounted for more than 75% of the total value of agricultural production in 2015. In 2015, the average of on-farm income for residence farms was negative. For this group, off-farm income – which was quite large- offset farm losses and accounted for more than 100% of total household income. Furthermore, residence farms had the highest off-farm income of all categories. 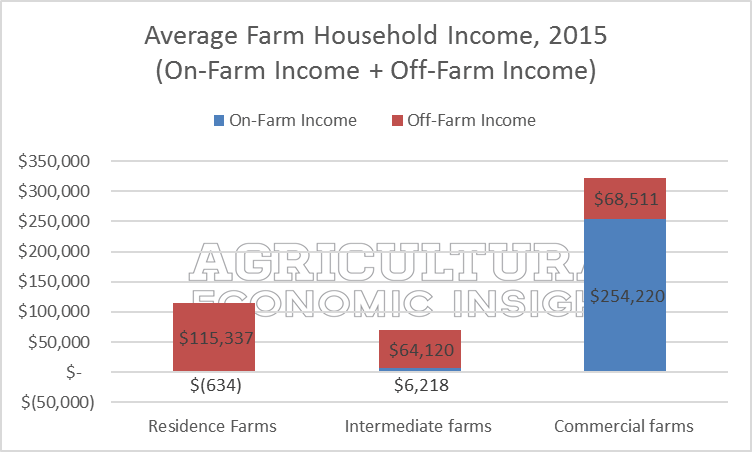 For intermediate farms, on-farm income was a more important source of total farm income. On-farm income accounted for nearly 9% of household income while off-farm income accounted for more than 90%. For commercial farms, on-farm income accounted for the majority of household income (76%). Off-farm income for this group was only slightly larger than intermediate farm levels. Figure 2. Annual Average Farm Household Income; On-Farm (blue) Plus Off-Farm (red), by USDA Farm Category Type. 2015. Data Source: USDA ERS. It is important to note that these income data do not account for debt-service requirements. Farm debt for residence farms averaged $31,000 in 2015 while nearly $637,000 for commercial farms. While household income is considerably higher for commercial farms, this should be expected given debt payments would be made from the reported income. 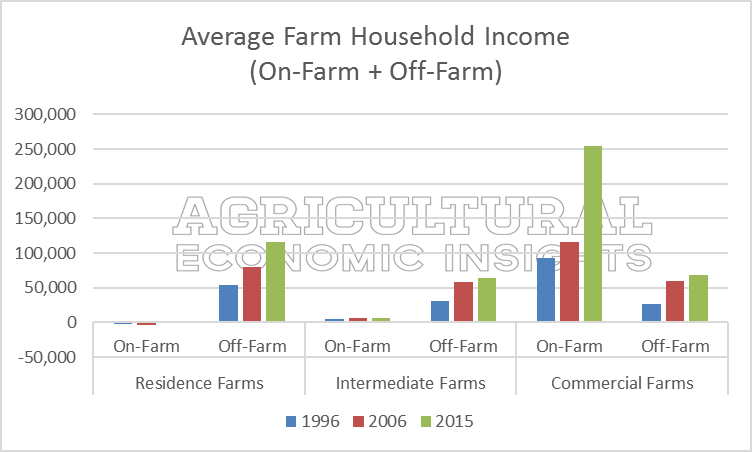 For a broader look at the relationship between on-farm and off-farm income by farm type, the same data – presented in a slightly different manner- is shown for 1996, 2006, 2015 (figure 3). As one can see, the general trends observed in figure 2 hold true for the other years observed. Most noteworthy, on-farm income for residence farms was, on average, negative each of the three years observed. This is important to keep in mind given they accounted for a majority of farms in 2015. Figure 3. Annual Average Farm Household Income; On-Farm (blue) Plus Off-Farm (red), by USDA Farm Category Type. 1996, 2006, 2015. Data Source: USDA ERS. While the USDA has recently cited off-farm income in recent updates about the farm economy, there are some important notes from the data to point out. First, average off-farm income dipped in 2015 as the farm economy slowed down. This was a double-hit for the average family farm household. Off-farm income turned higher in 2016 and both on-farm and off-farm income are expected to be higher in 2017. The significance of off-farm income varies across family farm type. For a majority of family farms (residence and intermediate farms), off-farm income is the largest source of total household income. On the other hand, commercial farms are heavily reliant on on-farm income as it accounts for more than three-quarters of household income. Given this, the slowdown in the farm economy and dip in net farm income is likely to affect these commercial farms the most. As mentioned before, these data do not consider debt payments as household income (on-farm and off-farm) is what producers use to pay their farm debt. Declining incomes will make servicing these debts more difficult and, as a result, the USDA’s commercial farm category will likely feel the dip in farm incomes the most. While a majority of operations are more heavily reliant on off-farm income, this is not the case for commercial producers – those with more than $350,000 in gross farm income. Accounting for a small share of total operations (less than 10%), they collectively account for nearly 75% of production. Accounting for a large share of total production, these are the operations that ag lenders, ag retailers, and ag manufactures think about as being their core customer. Given the numbers in this post it is unlikely that off-farm income will completely cushion the downturn (or save the day) for most commercial farm households. Residence Farms – Less than $350,000 in gross cash farm income and principal operator is either retired or has primary occupation other than farming. Intermediate Farms- Less than $350,000 in gross cash farm income and principal operator whose primary occupation is farming. Commercial Farms: $350,000 or more in gross cash farm income.